Monday is August 1st and you know what that means? 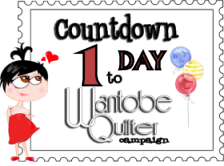 The Wantobe Quilter Campaign at StashManicure Blog begins. I know how many of you reply to my posts when I do a giveaway. I even remember two years ago when I did a month of giveaways (I was nuts then :) all the comments that came into the IHAN blog. StashManicure Blog is having THREE MONTHS of giveaways...YES THREE MONTHS. Madam Samm is going to be swamped-flooded-monsooned with e-mails. 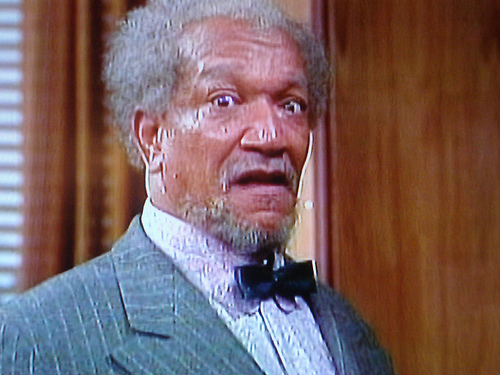 you better tell Elizabeth that Fred is on his way. What are you waiting for? Call every person you know who have an interest in becoming a quilter and get on the bandwagon....this is going to be so much fun. My thanks to everyone who has wished me well. I'm wishing myself well too :) There are days that I either wished I had gone to medical school or that I had married a Dr....ever have one of those days? I'm guessing those married to Drs wish they had married a Masseuse...or a Dentist or a Mechanic....I so understand polygamy now....I'm thinking it might be great for women to have several husbands or wives....what ever and who ever can do all these things...I know I want a Wife too!!! Even though I'm been sick (kidney infection) I've still had some good laughs and some smiles today. I have to show you what I found and of course I had to add all of these to IHAN as well. First is this very fun magnet. I had to blow the photo up so it is a little blurry....tell me you don't know at least 5 girlfriends who would love one of these. I love, love, love it. I also learned there is an entire line of fun things for the "Sisterhood of Quilters" so I added an entire category to IHAN devoted to nothing but the "Sisterhood of Quilters." I might have seen these had I gone to Market in the Spring...I don't know but I sure am glad I found them cause they sure do make me smile. Inside are these cards. The larger one is, "The Sisterhood of Quilters" Mission & Motto, Membership and definitions...I'm telling you it is too funny. Then you get two Membership Cards.....I guess one for yourself and one to give away with the project. The best part is the fabric panel and pattern. Below are photos of what is on the panel and I'm telling you if I went to the beach with ladies who looked like they were having this much fun I'd never come back. I'm thinking this would be so much fun as a surprise throw for a friend. Can you imagine the smile on their face? 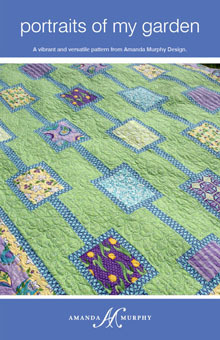 There are other Sisterhood of Quilters Panels too...just click here to see them all. Too much fun. Here is another really fun wall hanging that I'm going to make for my sewing room. I've always wanted something like this and now I've found the pattern. It is called, Written in Words by Bareroots. This pattern also comes with an additional pattern for the bag shown in the photo above. I love the little sewing machine and the words. I'm going to change some of the words to personalize it for myself....you know it has to say "Kelly's Sewing Room." I've gotten the embroidery bug lately. Many of you know I have three grown girls. Guess what each of them is getting on a package for Christmas this year? Yep...some Snow Folk....they have little pockets on the back for a little prize too. I guess I've been living under a rug because I had no idea that Rachel's of Greenfield had kits with their patterns. These will be a snap to put together because everything is in the kit. I like projects like this for the car ...when Rick is driving of course!!! I love things like this on the tree and I know the girls will love having their names and their hubbies names (two are married) on the ornaments. I feel like I've been lost in a time warp since I did not go to Spring Market. I would have known about all these things...or so I tell myself....who knows really? I know for sure I'll be living until I'm 127 years old...that's how many projects I have lined up. 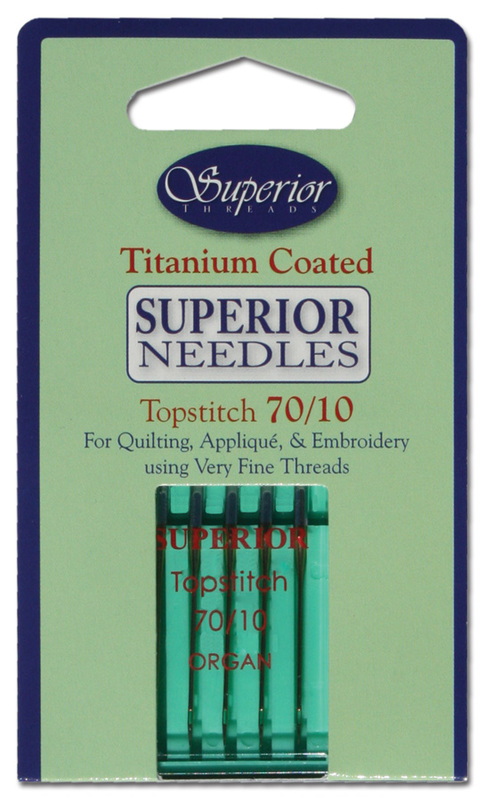 The notion today is the Superior Titanium Coated Topstitch Machine Needles. Why? Because I'm wrapping up the IHAN Needle Exchange Program and I still have some needles left to give away AND because if you don't know about Superior Titanium Coated Topstitch Machine Needles....then I'm just feeling sorry for ya. If you want to read all about how the IHAN Needle Exchange Program started just click here and it's also a tab on the top of this page. I know what you are thinking...."What is the big deal and needle is a needle is a needle." Am I right? That's what I thought until the first time I tried Superior Titanium Coated Machine Needles. I shared a package with Mrs. Rosemary aka Waldo and my dear friend in PA, Mary Jane. (Between the two of those gals they have over 80 years experience with quilting....other things too but I'm not goin' into that here...ROFL) So when I got to putting mine in my machine I could not believe how easy it was to thread. No more stabbing and licking...it just went right in. That was the first thing I noticed....a huge plus in my book. I tried to take a good pix of one of my Superior Titanium Coated Machine Needle but the flash makes it almost impossible and without it...the photo was way to dark. As you can see....the hole is a nice size. I'll blow up the photo below of the packaging and you'll be able to see it better. There that's much better. Ok....so first they are so much easier to thread. Second they are stronger and last so much longer because they are coated in Titanium. I knew I was impressed so I called Mrs. Rosemary and Mary Jane and asked them how they liked the needles I had given to them. Both gals said they really noticed a difference and they liked the Superior Needles. for Quilting, Applique and Embroidery using Very Fine Threads. 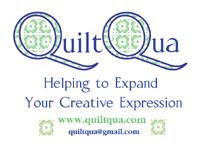 for Quilting, Applique and Embroidery. for Quilting, Embroidery and Applique using heavier threads. Sorry for the delay in writing back, but I didn't use the needle immediately--I finished up some mending projects, and wanted to wait until I was working on a quilt--which I just did, and I love the needle. I will definitely buy more, and I appreciate your needle-exchange program-what a great idea to enable people to try it first!! This past weekend I went to our quild's quilt camp and was given one of your new needles. The one with the gold color to it, I think it was titanium or something like that. I really like sewing with it. I put it in my machine and it was smooth sewing. I don't know how to explain it, but it was the feel of the sewing that was different. I will have to get some of them. Our camp organizer, Ruthie W. got them from you. Can you tell me the name of them so I order the right ones? Hi Kelly! Just wanted to say thanks, so very much, for the IHAN needle exchange program! I used the 70/10 titanium needle from Superior for an embroidery/quilting project. I loved it! I was using adhesive with appliqué, and for once, the adhesive didn’t gum up the needle and cause the thread to fray! I love these needles! I’ll encourage the other women in my guild that took a needle to email you their comments. Thanks again! Diane G.
I recently received a Superior Titanium needle size 16. I have been stitching away and have had no problems whatsoever. Thank you for the opportunity to trade in my used needle. I will be purchasing these needles in the future. I just finished a quilt with the needle you sent me and have pieced a second. So far I am very pleased. Thank you for introducing me to Superior needles. What fun would a review of the Superior Titanium Coated Topstitch Needles be if I didn't show you a quilt that was made using one? Mrs. Rosemary has been collecting Aboriginal Fabrics and she decided she was ready to make a quilt and she called to ask if I knew of a pattern that would be interesting. 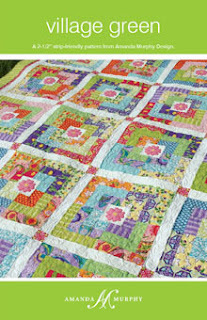 The first pattern that popped into my head was Chopsticks by Julie Herman of Jaybird Quilts. Here is Mrs. Rosemary's version of Chopsticks using her Aboriginal fabrics. I was in love the minute I saw this quilt. This is a "twin" quilt according to Mrs. Rosemary. Here it is draped across two twin beds so you know it is one long twin quilt....which makes me think....hey, I'm really tall....do ya think? No? Me either...but a girl can hope can't she? The batik Mrs. Rosemary used has some nice texture and still allows the eye a place to rest. 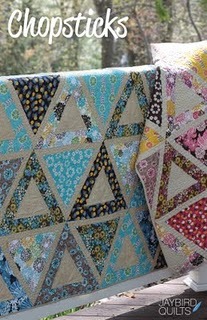 The triangles showcase the fascinating fabrics from Mrs. Rosemary's Aboriginal fabric stash. She used some extra strips and pieced them together for the backing. 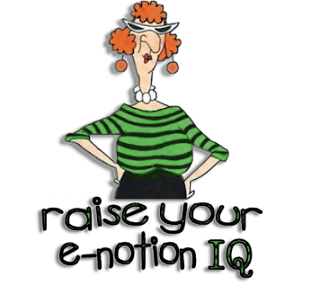 Do you have a notion you would like me to review? Just Ask! 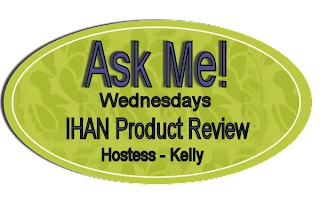 Feel free to e-mail me at IHaveANotion@yahoo.com and let me know if you have any requests for reviews. I hope Blogger is being kinder to all of you than it has been to me today!!! Great patterns--I love to win either of them! Thanks for the giveaway. Wold love to win this. A girl can never have enough quilting patterns, notions, and fabric. Congratulations Donna and Mouster1!! Please send an e-mail to IHaveANotion@yahoo.com and include the pattern you would like and your mailing address. A special THANK YOU to Amanda Murphy for her wonderful designs....your patterns and fabric are great!! "Why do those humans stare at us....they have no manners what so ever!!!" "Look at me...I'm holding a Burmese Python...I'm so brave"
When it's hot....ya jump into the nearest water. "Hey Lady...your hair looks just like mine in this heat! "I'm hot...don't mess with me....I'm warning ya." "Do these horns make me look big?....come on ...be honest with me." "I love little boys with carrots." Do you ever just go monkey around? 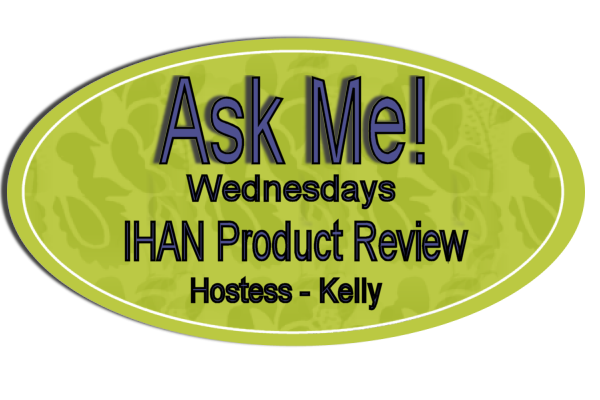 It's Wednesday again and that means it's time for a IHAN Product Review. Today I'm reviewing the Slice Fabrique. I chose the Slice Fabrique because I've had a number of e-mails recently asking questions about the Slice Fabrique. The Slice Fabrique's job is to cut out applique shapes in a variety of sizes (1"-4" in 1/2" increments) and those shapes depend on what design card you put into the machine. Here you can see I have a variety of the design cards....there are more...just click here to see all of the cards available. I put the Basic Applique Shape Card (included with the Slice Fabrique) into the back of the machine. After pressing the menu button I selected this flower. I'm making a onsie for a friend who has just had a baby. Then I put some of the adhesive on the glass cutting mat. Then I used the sponge brush that come with the cutter. I spread a thin layer over the glass cutting mat. That is what holds the fabric down while the cutter is doing it's magic. I then run over to my ironing board and fuse some Robert Kaufman Daisies & Dots Charm Squares by Piece O'Cake Designs. In my previous review of the Fabric Fabrique I wrote about the fusible that I used. After working with my Slice Fabrique several times I only use the Slice Fusible Web because every time I cut a design it works. It does work with the others like I said in my earlier review....but I found there were times it didn't work and I'm one of those who can't stand being frustrated. My Slice Fabrique has a little home dock because if I didn't have one my stuff would we everywhere and again I'd be frustrated when I went to use it. Do you have that problem? If something doesn't have a "home" I can't ever remember where the parts are and I waste my time searching instead of sewing. This is the little cheat sheet that tells ya all the applique designs on the Basic Applique Card. Each card comes with a cheat sheet. I'm ready now to put my design on the onsie. I put this pressing ham inside the onsie...I know it looks odd....but it really did the trick. If you want to know all the rest of the details about the Slice Fabrique you'll find all that information HERE.